Vinification & Aging: The grapes were whole cluster pressed and the juice was settled and racked off the lees into stainless steel tanks. Fermentation took 7 – 10 days under temperature controls, after which the wine was aged in stainless steel tanks for 9 months. A light filtration was followed by bottling and an additional 3 months bottle aging prior to release. Description: Straw color with green highlights. Floral and ripe apple aromas. 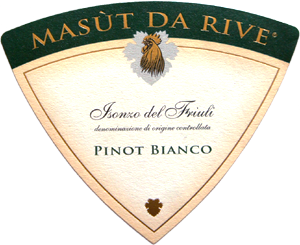 The wine is soft and harmonious on the palate with sensations of almonds and ripe peach. The finish is smooth and pleasing. Food Pairing: Aperitif; mild cheeses, pasta dishes, fresh fish.